RJD chief says country is moving towards dictatorship. 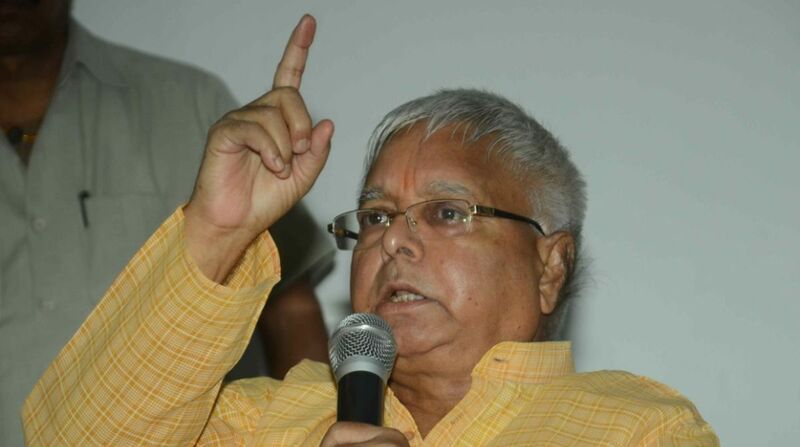 Unmindful of court’s warning about not to make political statements, RJD president Lalu Prasad on Wednesday launched heavy attacks on Prime Minister Narendra Modi over arrest of five rights activists with alleged Maoist links and alleged the country was moving towards dictatorship. This was the first time in three months that he had made political remarks since he was granted provisional bail on health grounds in May this year. “The country is heading towards dictatorship. On Tuesday five intellectuals were arrested (on the charge of hatching conspiracy to assassinate the Prime Minister). Anybody could be arrested anytime. This has paved way for declaration of emergency in the country,” he told newsmen at the Patna airport on Wednesday before leaving for Ranchi to surrender before the court. The Jharkhand high court, it may be noted here, has rejected his appeal for further extension of his provisional bail and asked him to surrender by 30 August. Prasad who was surrounded by his supporters shouting “Lalu Prasad Zindabad” also took a dig at the Prime Minister for his murder conspiracy remarks. “Prime Minister kahe ki unki hatya ho jayegi achchha nahin laga (It’s strange a Prime Minister is feeling insecure. It has not gone down well in the society),” he said. He also cited bigger political conspiracy behind filing of cases against him and his family saying it was done only to somehow keeping them away from election process. “The cases are continuing against us since the government wants to keep us busy in court wrangling till the elections are over. All cases are false and baseless,” he claimed. He said he had full faith in judiciary and would indeed get justice one day. He also took a dig at the prevailing law and order situation in the state, describing the situation quite much alarming. “There is neither law nor order in the state. A state of complete anarchy prevails all over,” he alleged, comparing the CM Nitish Kumar with a proverbial “Nero who was playing flute while Rome was burning”. This was the first time in three months that Prasad made political comments in public although he had been granted provisional bails on the ground that he wouldn’t indulge in political activities or make political remarks during this period. Till last week, he had strictly followed the court’s instruction, politely refusing to give statements to the media despite their repeated requests. “Bolna nahi hai. Instruction hai. Tabiyat theek nahi hai (I have not to speak (with media). There are instructions. My health is not good),” was how Prasad told reporters while on his way to his residence in Patna from Mumbai hospital last week.